For most travelers, experiences, impressions, souvenirs and pictures earmark their adventures to other lands. At best remembrances of countries seen come back in bits and pieces. And once back home it is from these images that memories are made. Having just returned from a five-week trip to Australia - the continent down under – true to form, this traveler’s experiences and impressions are returning in glimpses … those proverbial bits and pieces. GOLD COAST, QUEENSLAND, AUSTRALIA - A place who’s truest treasures lie in its friendly people, beautiful beaches and never-ending waves. The Gold Coast coastline is very unlike what one would expect. Although there are miles and miles of wide, finely grained, white sand beaches, rhythmically caressed by lukewarm, aqua-hued surf that seemingly has no end, there are also miles and miles of high rise buildings, resembling metropolitan cities, rather than laid-back beach towns. From Surfer’s Paradise to Broadbeach, to Mermaid, Miami and Burleigh Heads, high rises mar the exquisite landscape. 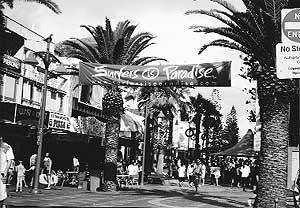 Bustling crowds of locals and tourists fill the towns, parks and beaches to overflowing, and traffic regularly comes to a stand still.Tourists flock to Surfer’s Paradise on the Gold Coast. 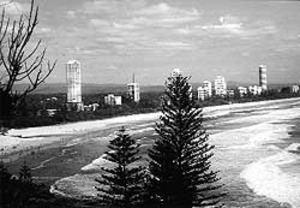 But take heart, all is not lost, this blight begins to diminish further south at Coolungatta, Tugun (pronounced chewgun) and Kirra where the seaside towns are much smaller, have moratoriums on high rises, are less crowded and offer more of the beach town atmosphere one would expect. USA’s winter is Australia’s summer. Weather in Aussie land is typically tropical, very hot and humid, with intermittent rainfall and lots of wind. Resort swimming pools have no need for heaters as the sun is hot enough to heat them up. Evenings cool down very little and the shrill sound of cicadas fill the air daily, while flocks of larakeets lend their serenade to the dusk. A very family oriented society, the Aussies spend lots of time with and frequently travel with their children and extended family members. Flights into, out of and around the country are filled with children from infant to teens. On the flip side, Australians are strongly opinionated and don’t have any trouble giving you a piece of their mind. They love to have a joke at your expense and love it when you quip back at them. This straight-forwardness can come off as crude and even rude if you are the oversensitive type and have a tendency to take offense. For the Australian, minimum wage is based on age. A young person in their teens may expect a minimum $15 per hour, while someone in their 30s receives minimum $30 per hour, and all workers receive a month’s vacation each year. There is no tipping in the land down under, but pricing of goods and services seems high. No smoking signs are a rarity there. At times it seems that everyone smokes, and not many establishments forbid it. Sunday is drinking day for many Aussies. Most businesses are closed, except for the eateries and bottle shops (liquor stores). The pubs (drinking establishments) are packed. They are family places where dad, mom, kids, extended family and friends go to eat, drink and party. Parks line most of the beaches and those not frequenting the pubs go to the seashore. Lots of VB (Victoria Bitters beer) and/or wine (especially the sparkling kind) flows. There are shrimps (huge prawns - the biggest this traveler has ever seen), sausages (their version of hot dogs) and steaks on the barbie (BBQ). 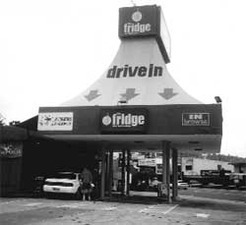 Although drunk driving is outlawed, driving while drinking a beer is permitted and the bottle shops have drive-thrus. Gambling and prostitution is legal in Australia and game machines, lotteries, keno, bingo and sportsbetting can be found in casinos, pubs, individual establishments and at stadium events. Australian drivers don’t yield they give way, and the roundabouts take the place of boulevard stops. First driver in the roundabout has the right of way and if taking the first exit out of the round, one stays in the left lane, if taking the second exit, one stays right. This method seems to keep traffic flowing and helps avoid accidents. Pedestrian crossings beep to tell one when to cross – great for children, the oldies (Australian pensioners) and infirmed. While the driving is to the left, the walking is all over the place. Dodging, that’s the watchword when footing it or crossing streets in the land down under. Like the USA, the Gold Coast has supermarkets, the most popular being Coles and Woolworths (if you believe). These markets are most always within enclosed malls like those in the states. They can be found there along with news agents (magazine / newspaper shops) chemists (pharmacies), Posts (post offices), clothing and shoe stores, jewelry shops, boutiques, candy stores, bakeries, pie shops (the Australian staple of the Shepherds, meat and vegetable kind), fresh fruit and vegetable stands, butcher shops, variety stores and food courts. Everything is extremely fresh and tasty in Australia, and outside the malls on nearly every street one finds a bakery, pie shop, fruit and vegie stand and butcher. Smoothies and gelati ice cream are popular fare. And you don’t do take-out there, you take-away and request a carry bag. Australian SpeakHigh rises thin out as you travel south from Surfer’s Paradise. The English spoken in Australia has a style all its own. One doesn’t rent, they let. One goes on holiday, not vacation. A bus stop is a setdown. One doesn’t ask for a restroom , but rather for a toilette. To shout is to take one’s turn buying. The differences in language usage abound. Of course, there is much more to Australia than the brief images of the Gold Coast mentioned here. This is only one small vision of an area that covers a vast rugged continent composed of coastal and metropolitan cities, spectacular sights, hinterlands, lush rainforests and bushlands. A place where semi-tropical climates breed adorable kookaburras, sloe-eyed koalas, soft-furred kangaroos, Joeys (baby Kangaroos) and wallabies, as well as fierce alligators, crocodiles and poisonous snakes. This is a land and a people much like the USA was in the 1950s – but less uptight and not so concerned with image or with being politically correct. To visit this land is to have an adventure. One that is well worth taking and remembering – if only in glimpses, images, and bits and pieces. “Good on ya”, if you ever have the opportunity to go there.